From portable urinals to cold-brew coffee, two D.C. entrepreneurs are building customizable vending machines and stocking them with unique goods. WASHINGTON — Imagine a world where your afternoon snack attack could be satisfied by a package of locally smoked salmon, not a Snickers — and your thirst quenched by kombucha, not Coke. That’s no longer a food fantasy. 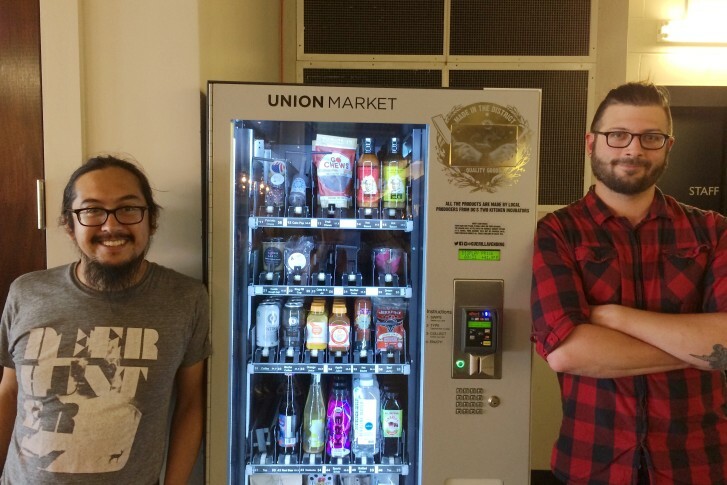 In 2015, Alex Hastings and Mike Galyen decided to take the typical vending machine experience to a new level. They wanted fewer bags of brand-name chips and more options for D.C.-made products, like artisanal jerky and cold-brew coffee. “We were just talking about how [vending machines] are not something that’s really done in a cool or new way or even taken advantage of fully in America. In Japan, it’s something completely different from what it typically is here,” Galyen said. So they did, with their company Guerilla Vending. Hastings and Galyen’s unique and curated vending machines can be spotted at businesses throughout the city, including Union Market, Maketto, Atlas Brew Works and The Pug, where they are all different, based on the needs of the business. At Atlas Brew Works, one of the city’s beloved breweries, the machine is stocked with Dirty South Deli sandwiches, beef jerky, pork rinds and other bar snacks. “At bars and breweries that don’t have food options, a lot of times they want a food option to help people stay, and so that model of machine that we do is really built to serve places that don’t have a kitchen,” Galyen said. At Maketto, a mixed retail and restaurant space, owner Erik Bruner-Yang decided to fill the machine with Asian toys and peculiar items of convenience, such as Japanese portable urinals, headphones and maneki-neko lucky cats. And the selection is always changing. “We’re doing a lot of custom art in there too now,” said Hastings, including sticker packs from local artists and letterpress cards from Typecase Industries. Union Market’s machine has cold-pressed juices and cake in a jar, among other snacks from local makers. “It allows more vendors access to the market that would otherwise have a hard time getting in here,” Hastings said. Both of the Guerrilla Vending founders have full-time jobs, in addition to their year-old venture. Hastings is a scientist for the U.S. Navy and Galyen is a co-owner and operating manager at The Paper Horse Ramen Shop. In their “spare time,” they’re in the basement taking apart vending machines and constructing more customizable versions. “There’s a pretty steep learning curve in building them out and figuring out how they work. Luckily we both have engineering backgrounds, so we like doing that sort of thing even when it’s kind of frustrating,” Hastings said. Guerilla Vending currently has machines in five locations, but Galyen says they have plans to expand and include more of D.C.’s growing number of culinary entrepreneurs. “We feel like it’s a great thing to really represent the best of what D.C. has to offer in one little box,” Galyen said.